The calculator app you've always needed, but never had. Fraction calculator adds, subtracts, multiplies, and divides fractions so you don't have to convert, but if you need to convert to decimals or just need a regular calculator, fraction does that too! Switch modes to convert from feet and inches to feet or inches and even meters or millimeters. With fraction you can cycle through four distinct calculators. The first page of the app is a fraction calculator. The second page is a standard calculator. 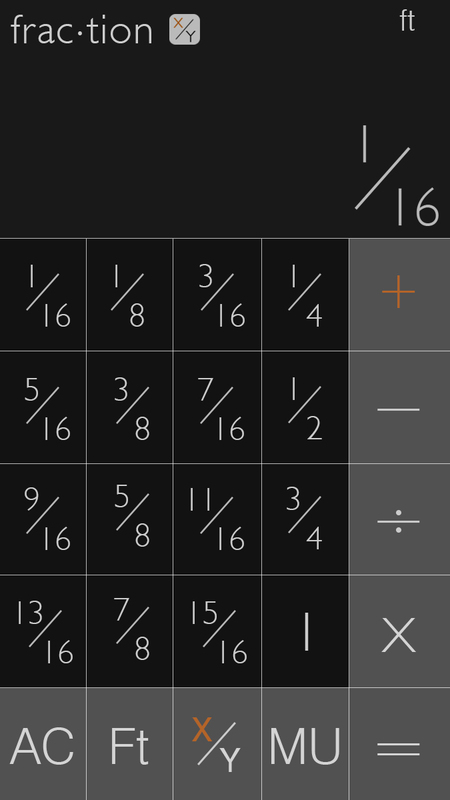 The third page when flipped to landscape is a whole number and fraction calculator so you can calculate all your measurements and fractional needs. The forth page resembles a tape measure (not to scale) with scrolling measurements up to one inch so you can calculate as you would from a tape measure. All pages function as a unit conversion with the ability to convert from fraction to decimals, feet and inches, just feet, just inches, meters, and millimeters. Every page is also designed for a comfortable and ergonomic use with you in mind. Add, subtract, divide, multiply, convert. Use page 1 as a fractional calculator and convert (MU button) from feet to inches to meters to millimeters. Press the x/y button to cycle to page 2. At any time press the frac·tion button at the top for tutorial page. Page 2 functions in feet or inch mode as a normal calculator. Also very useful for adding feet and inches by pressing any number followed by the Ft button transitioning the mode to feet and inches immediately (i.e. 1ft 2in). Turn the device to landscape for page 3. 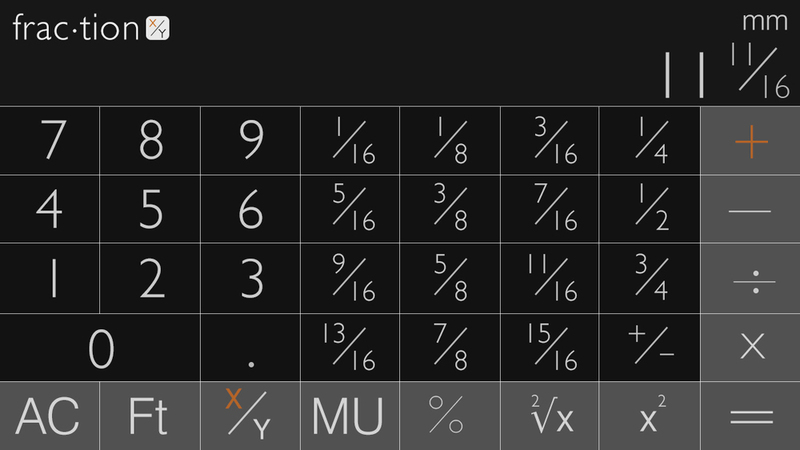 By turning the device to landscape view, the calculator automatically switches to the page 3 layout. Add, subtract, divide, and multiply whole numbers and fractions in almost any combination imaginable. Press the MU button in landscape mode for page 4. Page 4 is a scrolling tape measure (not to scale) with operable fraction buttons for fun or quick reference on your unreadable tape measure. Add, subtract, divide, and multiply fractions up to one. Have fun and enjoy the ease and functionality of fraction calculating!